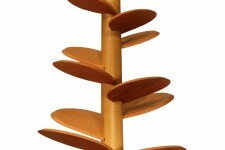 This tree shaped musical toy sounds similar to a xylophone. Place the marbles at the top of the tree and they will make each leaf ring as they descend. The motion path of the marbles is never completely the same. The challenge is to make all of the marbles tumble down without straying from the motion path surrounding the trunk. This sound game for all ages is also a decorative piece that never fails to impress!